The Antarctic Peninsula is the most-visited region of Antarctica. This northward-reaching extension of the polar continent reaches within 1000 miles of the southernmost tips of Chile and Argentina. It includes both the landmass of the actual continent of Antarctica, numerous islands, and the ice sheets that extend and connect many of these bodies of land. Cierva Cove. 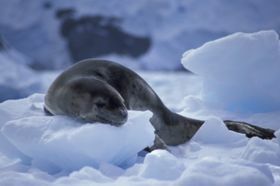 While no landings are possible due to land areas being designated areas of special scientific interest, the cove is home to dozens of leopard seals which lounge on the ice flows. Deception Island (part of South Shetland Islands). Baily Head. Home to the world's second-largest colony of chinstrap penguins, set amidst an incredible natural amphitheatre. The penguins come and go from the colony through a narrow passage, with thousands of penguins following American driving rules by always walking on the right. Whaler's Bay. Hot springs, the remains of an old whaling station, and the remains of a British Antarctic Survey base destroyed by eruptions that lasted from 1967 through 1970 are the highlights of this stop. Pendulum Cove. A popular spot for visitors wanting to take a swim in the hot springs and thus claim the distinction of having swum in Antarctic waters. Gerlache Straits. A narrow body of water that stretches along the picturesque Danco Coast on the west coast of Graham Land, part of the Antarctic Peninsula. These straights offer amazing opportunities for watching Humpback, Minke, and other whales and marine mammals. Neko Harbour and Andvord Bay. These are among the most beautiful areas in Antarctica offering views of sculpted icebergs and surfacing whales in the inner bays that are surrounded by spectacular glaciers and mountains. This is a good place to watch whale feeding behavior as they engulf enormous krill swarms. Hannah Point. This point of land is located on Livingston Island, part of the South Shetland Islands located at the tip of the Antarctic Peninsula. A large Chinstrap Penguin colony calls Hannah Point home. Other birds include Gentoo Penguins and scavengers like South Polar Skuas, Kelp Gulls, Southern Giant-petrels, and Snowy Sheathbills. Also find excellent examples of Antarctica’s only two flowering plants, Antarctic Hairgrass and Antarctic Pearlwort, a complete flora of the entire continent at one site. Paradise Bay. This scenic bay is a favorite places for Zodiac cruising to view marine mammals up-close, including Minke and Humpback Whales plus Crabeater and Leopard Seals hauled out on ice floes. Almirante Brown, one of Argentina’s Antarctic Bases, is located along the bay. Paulet Island. A volcanic island that is home to the largest adelie penguin colony in the world. The strenuous hike to the top of the island takes about three hours round trip and offers incredible views of the surrounding area. In addition, the remains of a hut used by the Nordenskjold expedition can be found on the island. Peterman Island. Petermann is outstanding for seeing Gentoo and Adelie Penguins at their nest sites and making feeding trips in large groups along a "penguin highway" in the snow. The clear water is beautiful for observing and photographing penguins returning to land. Port Lockroy. Since 1996 the historic base at Port Lockroy on Goudier Island has been staffed by the UK Antarctic Heritage Trust during the Antarctic summer. Receiving about 10,000 visitors a year, it is one of the most visited sites on the continent. Visitors can tour the museum, buy souvenirs, post mail, and view the large gentoo penguin colony. The Antarctic Peninsula is almost a mirror image of southern South America. In fact, it's a geologic extension of the Andes mountain range; an underwater ridge looping through South Georgia and the South Sandwich Islands connects the two features. It is claimed by Chile, Argentina, and the United Kingdom, with the United States and Russia both reserving the right to stake a claim should the Antarctic Treaty ever fall out of force. Under the provisions of the treaty, international access to the territory is permitted. This region of Antarctica is anything but a wasteland. Many animal species call this area home and concentrate in the short Antarctic summer to reproduce; it is here that you will find huge colonies of penguins. Wildlife that can be seen include Adelie, Chinstrap, Gentoo, and Emperor Penguins; Humpback, Minke, Blue, and Orca Whales; Crab-eater, Weddell, Elephant, and Leopard Seals; Blue-eyed Shag, Southern Giant Petrel, Cape Petrel, Kelp Gull; and more. There are no airstrips along the Peninsula, so the only access to it is by boat. Most tourists arrive on ships with an ice-strengthened hull. There are many islands scattered along the west side of the Peninsula, several of which are occupied by scientific research bases organized by different countries. Cheesemans' Ecology Safaris, . Offers an in-depth itinerary that stresses maximum time ashore and Zodiac cruising with a large staff of Antarctic veterans. They offer various itineraries on different years, including an extended Antarctic Peninsula and Continent only expedition. Their special extended Peninsula itinerary explores the remote and iceberg-filled Weddell Sea, the many wildlife-rich islands in the northern and western Peninsula and South Shetland Islands, the great white continent itself, and a push south to the Antarctic Circle. They charter an entire ship that is the best fit for the expedition and always take less than 100 people so all can land at once to provide more time ashore. Oceanwide Expeditions , explores the most remote places in and around the Antarctic region with their own ships and expedition crew. Passengers are taken from Ushuaia to the Antarctic Peninsula and its surroundings such as the South Shetland Islands. With fully equiped zodiacs passengers are going ashore on several locations, which are rich in wildlife and offer plenty of opportunities for exploring activities. Many different itineraries are offered by tour companies, from short 7-day to extended 20-day voyages. The longer itineraries offer more landings and can travel farther south than shorter versions; they are also more flexible and can adjust landings if weather and conditions become an issue. Tours usually start in Ushuaia at the very tip of South America then sail for about two days across the Drake Passage to the Antarctic Peninsula. The west side of the peninsula is navigable since it is relatively ice-free during the Antarctic summer tourist season. Many islands are scattered along the coast here providing many landing sites for visitors. Huge penguin colonies are usually found in ice-free areas such as on Paulet, Deception, and Livingston Islands. Zodiac cruising is popular along the peninsula where landing is either not permitted or not possible, providing a great way to see whales, seals and penguins on ice floes. Landings on the Antarctic continent itself can be accomplished in several areas such as Almirante Brown, Neko Harbor, and Brown Bluff. Tourism in Antarctica is strictly regulated to protect its fragile and pristine environment. The Antarctic Treaty provides strict guidelines to reduce tourism impacts. Private tour companies formed the International Association of Antarctic Tour Operators (IAATO) in 1991 to promote responsible tourism in the Antarctic regions. Tour itineraries must be approved by and registered with IAATO. Food is limited to what is brought in by air or boat. Depending on your accommodations, you could experience a very limited menu all the way to larger cruise ships with several dining options. The cuisine is also influenced by the nationality of the tour operator and expected guests. On a small cruise ship with between fifty and a hundred guests, the dining was buffet for breakfast and lunch, and a more formal dinner with two main dish options. Italian or barbecue might be the theme of a night's dinner. Historically, travelers to Antarctica had very few food options. Packaged food was the majority of the diet. This would be supplemented by locally caught seal, penguin, or whale meat. Two of the southernmost postoffices in the world are located in the region, from which you can send mail with a true "Antarctica" postmark—and these are (relatively speaking) the most accessible ones where you can do so, given the difficulty of getting to US Post Office at South Pole. One of them is located at Villa Las Estrellas (the only permanent civilian settlement of the continent; part of President Eduardo Frei Montalva Base on King Island), and the other at research base-turned-museum Port Lockroy, run by Chilean Post and UK Antarctic Heritage Trust, respectively. Postage for a standard letter or card costs US$2 to anywhere in the world from either postoffice, part of which is directed to the upkeep of the museum when paid at Port Lockroy. This page was last edited on 15 January 2019, at 03:26.